For well over a year after beginning our financial journey, we debated cutting our satellite/cable expense. The problem was that we had always had TV, and not having it seemed crazy. For that once in a while football game for my husband, it was just too much to give up. After a year of debating, we finally gave it up, saving us tons of money, and have never looked back! Truly, we have never missed it. 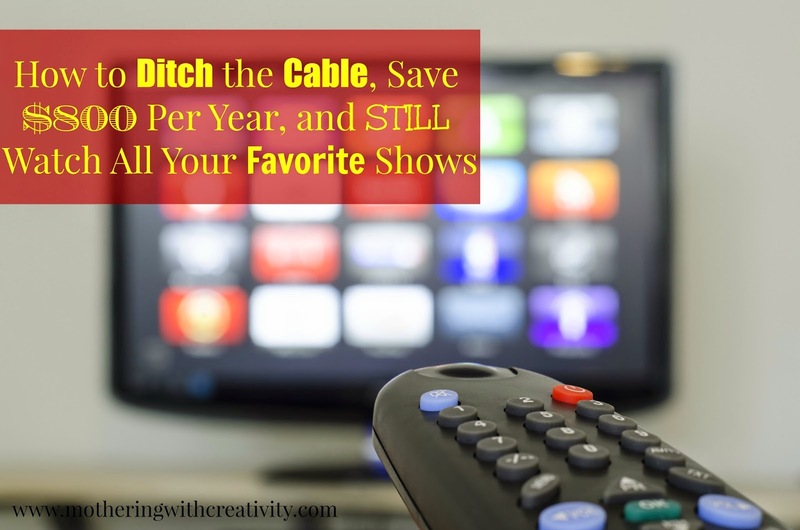 You can save quite a lot simply by cutting the satellite/cable TV bill, while still being able to watch all of your favorite shows (and trust me, we are total TV watchers). We used to pay $83 per month for our satellite TV. That adds up to $996 a year! By cutting out our satellite TV, we save about $800 a year, while still watching all of our shows! Apple TV: Apple TV is a must-have if you plan on streaming shows from Amazon or Netflix to your TV. These are a small little box and cost about $99 new. Netflix- Netflix costs about $8 per month and you can stream shows right to your TV. We have an Apple TV thing-a-ma-jig that was given to us for free. It allows us to stream Netflix easily to our TV and watch lots of commercial free shows. Netflix has shows and movies, and lots of kid friendly ones, too! Hulu Plus- We have used this before, but we do not currently have a subscription to Hulu Plus. Regular Hulu is free, but Plus costs about $8 a month and you have access to more shows than the regular option. Get a free 1 month trial HERE. Amazon Prime-Amazon Prime is, in my opinion, the best bang for your buck. Not only do you get FREE unlimited streaming of tons of shows and movies, but you also get FREE 2 day shipping and can borrow certain books on your Kindle for free, too. Amazon costs $79/year, and averages out to $6.58/month. You can also stream shows from an iPad or phone to your Apple TV via air play (this is new and exciting!). Bonus: There are exercise videos on Amazon so you can save on exercise costs, too! You can get a free 30 day trial to Amazon HERE. HD Antenna- This is actually a recent discovery for us. For $30, we were able to buy an HD antenna at Walmart and we can now watch (for free) all the local channels! This means that sports games are now available to us, too, which is absolutely worth it! I'm so happy my husband can now watch football games from our own home again! I personally recommend trying the free trials for each, checking out which programs offer the majority of shows you enjoy, and picking one or two. We have Amazon Prime and Netflix and find that we can watch pretty much everything we want with those two (for $14.58/month). So, for an initial investment of $130, plus $14.58/month, you can watch virtually ALL of your favorite shows and movies, AND have access to exercise videos, AND have FREE 2 day shipping from Amazon as a bonus. After your initial $130 investment, you can cut your TV costs to just $174.96 per year! That's a savings of $821.04 EVERY YEAR!!! As an added note, sites like CBS and NBC also put up recent full episodes of many of their network shows, and sometimes you can even find full episodes on Youtube, as well. What do you think? Do you pay for TV? 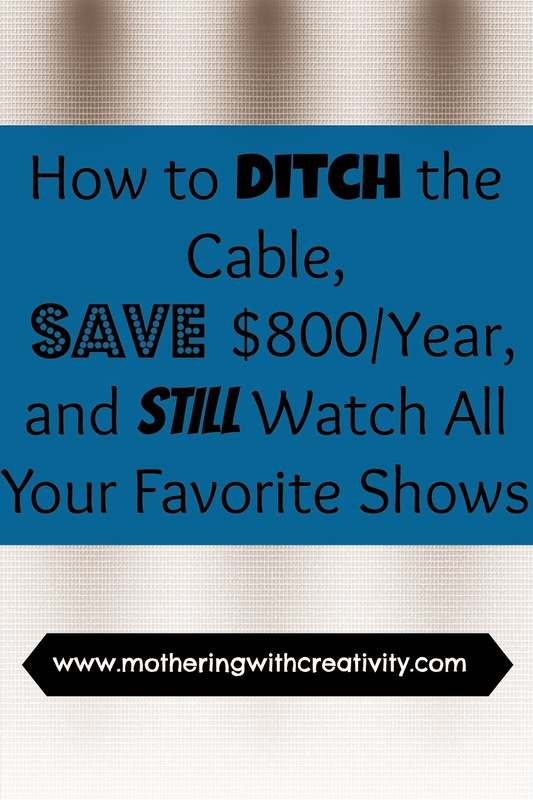 Have you ditched the cable? What is your favorite non-cable TV programs?